Electronic devices, used properly, can make backcountry travel safer and more enjoyable. GPS systems, cell phones, satellite phones and other devices can help people stay out of trouble, and can facilitate rescue in emergency situations. But the devices sometimes give people a false sense of security that can lead to trouble, according to this interesting NY Times article. Technology also sometimes allows people to call for help for ridiculous reasons, tying up resources and wasting time and money. Below are excerpts from the article. “Because of having that electronic device, people have an expectation that they can do something stupid and be rescued,” said Jackie Skaggs, spokeswoman for Grand Teton National Park in Wyoming. “They told their father that they intended to record their entire trip on video camera as an entry into the ‘Man vs. Wild’ competition” on television, investigators wrote. Far more common but no less perilous, park workers say, are visitors who arrive with cellphones or GPS devices and little else — sometimes not even water — and find themselves in trouble. Such visitors often acknowledge that they have pushed themselves too far because they believe that in a bind, the technology can save them. But without two-way communication, the rangers cannot evaluate the seriousness of the call, so they respond as if it were an emergency. Enjoy The Antelope Island Stampede Over Labor Day Weekend! Looking for some family entertainment over Labor Day 2010? Come to the Davis County area of northern Utah for kite flying, hot air balloons, live music and fun. With over 21,000 attendees in 2009, the Antelope Island Stampede has grown and evolved into a premier regional event. Professional balloonists and kite fliers, nearly non-stop local entertainment on the stage, outstanding food, family activities, and the island mystique. The info below is from a festival news release. The festival will be bigger and better than ever with local bands stacked up on the main stage all weekend long with non-stop entertainment such as, Red Shot Pony, d. Scott Williams, Crossfire and Shades of Grey to name a few. Balloons will launch early each morning and put on a spectacular glow in the evenings (weather permitting). Scenic backdrops provide stunning vistas for guests to the island not to mention spectacular sunsets. The professional kite demonstrations were a big hit last year and new performers such as I Quads, are sure to amaze the crowds. Kiters have also been incorporated into the educational component at the Davis County elementary schools for the first time and promise a fantastic show for the students. Food, Art and Craft vendors have been expanded with more variety and Really Good Eats! Other activities include Horseback riding, Large Inflatables / Kids Area, Go Fly a Kite Area and more. Last year the festival drew approximately 22,000 people. Aside from the event there is so much to do and discover about Antelope Island. It is a captivating place with 36 miles of hiking and biking trails, the beach where you can swim and float in the Great Salt Lake, Buffalo Island Grille, The Visitors Center or Historic Fielding Garr Ranch. You11 never run out of things to discover on the island and the sunsets, spectacular! Bring your family and friends out for a great time Labor Day Week-end event and see why folks come back time after time to discover or rediscover Antelope Island. For additional information and updates on the entire festival. The Utah State Fair will open on Sept 9 and run through Sept 19, at the Fairpark, 155 North 1000 West, in Salt Lake City. The traditional-style fair features entertainment, food, demonstrations, craft items, agricultural displays and more. See the fair website for detailed information. The Ham Bone Express Racing Pig Show is included with your gate admission. And so are Sea Lion Splash, Rock-It the Robot, Amazing Rainforest Experience, Farmer Bob and Johnny the World's Funniest Tractor, George of the Juggle, and SO MUCH MORE! The St Louis Post Dispatch has this interesting article about the great golf available in the St George, Utah, area. Below are excerpts. When Mormon leader Brigham Young passed through a small settlement in 1861 in what is now the southwest corner of Utah, he looked at the desolate landscape and made a prophecy. "There will yet be built between those volcanic ridges a city with spires, towers … and homes with many inhabitants." If Young had been able to see further into the future, he might have added "and some really fine golf courses." As the population grew, so did the number, and quality, of the golf courses. The St. George area boasts 11 public courses in an idyllic setting between the ridges, buttes, mesas and mountains that once caught Brigham Young's eye. While St. George previously attracted primarily snow birds, it now also lures golfers, who are drawn by the scenic beauty, favorable weather and reasonable greens fees. "It's turned into a little golf mecca," said Colby Cowan, head professional at Sand Hollow Resort, whose 18-hole championship course is a stunning layout that opened in August 2008. Sand Hollow was No. 7 on Golf Digest's list of the nation's best new public courses for 2009. Golfweek lists Sand Hollow as No. 1 among Utah public courses. Coral Canyon, another St. George-area course, is No. 3. Nine of the area's courses comprise the Red Rock Golf Trail, in association with 14 lodging properties within 15 minutes of St. George. Stay-and-play packages can be arranged online at redrockgolftrail.com or by phone at 1-888-345-2550. Park City Mountain Resort ski passes passes are now on sale for the 2010-2011 season. New this year is a "My Pass My Way" option where people can customize the pass to get just the features they want. Firsttracksonline.com has this article about the new option. Here are excerpts. All season passes include unrestricted “Mountain Access” to Park City Mountain Resort’s 16 lifts. Users can choose one, two or three customizable options that include Fast Tracks (access to the express lanes at the resort’s five busiest lifts), night skiing and riding (extended this season until 9 p.m.) and/or slopeside underground parking. The customizable season passes are now on sale. Natural gas powered cars have long been able to refuel along the I-15 corridor, from the Salt Lake area all the way to Los Angeles, but few stations offer natural gas in rural Utah. Now a station has opened in Naples, just south of Vernal, so people traveling in the Uinta Basin can fill up with the alternate fuel. The Salt Lake Tribune has this article about the new station. Below are excerpts. The Uinta Basin is suddenly on the map of destinations for drivers of compressed natural gas vehicles, now that Questar Gas and partners have opened a first Utah fueling station well away from the Interstate 15 corridor. It’s still unlikely that drivers could get from Salt Lake City to Denver unless they have a bi-fuel vehicle and can switch to a gasoline tank. But Giles said Colorado has a coalition committed to rapid expansion of the CNG fueling network, and such a corridor likely will be completed soon. Meantime, Clean Cities and Questar are committed to making a new push along Interstate 80 at the Wyoming and Nevada state lines, giving Utahns another east-west CNG route. The 12th annual Western Legends Roundup will be held 26-28 in Kanab, Utah. Movie Stars * Eatin’ * Singin' * Dancin' * Stompin' * Shoppin' * Shootin' * Quiltin' * Parade * Cowboy Poetry * Tractor Pullin' * Workshops * Kid's Roundup * and MORE! If you are interested in cowboys, Western history, Western movies and folk culture, you'll love this event. The stated mission of the Roundup is: To Develop, Promote and Preserve Our Western Legends, Culture and Heritage. Dozens of Hollywood feature films and TV shows have been filmed in the Kanab area. Stars from some of those films will participate in the festival. Events include dinner and breakfast with the stars, with autograph sessions. David John & the Comstock Cowboy's! They spent a week in late May in this remote area of southern Utah, rafting the San Juan River, camping on the soft banks and hiking the tributary canyons. AOL Travel has this article outlining what it calls a perfect family outing in Salt Lake City. Below are excerpts from the article. Here is our suggested itinerary of fun and exciting travel destinations that you and your kids will love to explore in Salt Lake City. After eating a hearty breakfast somewhere convenient, start your family vacation day at This is the Place Heritage Park (2601 East Sunnyside Ave.; 801-582-1847). Nestled in beautiful Emigration Canyon, this interactive historic park will take you back in time to the earliest settlers and the Native Americans who called Utah home. For lunch, head to the Old Spaghetti Factory (602 South 500 East; 801-521-0424). Located in historic Trolley Square -- a real Trolley station converted into a mall -- The Old Spaghetti Factory in Salt Lake City, Utah has an environment your kids will love, starting with a real trolley car right in the middle of the restaurant! Bellies full, you're ready for your next adventure on this family vacation day in Salt Lake City, Utah with kids -- atDiscovery Gateway children's museum (444 West 100 South, Gateway Mall; 801-456-5437). Pilot a medical helicopter. Become a paramedic to help save lives. Step in front of a camera to report the news. Grow your own garden. Work in a beehive. Or drive a real car. These are just some of the fun, interactive, and educational workshops your children can participate in at the museum. Finish off your day with a meal at The Mayan (9400 South State St., Sandy; 801-304-4600). Step into an ancient Mayan temple, and find yourself inside a tropical rain forest. Dine in an elaborate treehouse, complete with hanging lanterns, thatched roofs, and rope rails in front of a four-story waterfall. Your kids will love the animals singing and dancing the night away on the ancient cliff. Watch as cliff divers dive, spinning in the air, from the waterfall to the pool below. Diners beware: The front-row seats will get wet. Active Junky has this report about rock climbing in the Indian Creek area near Moab. The report includes nice photos and a fun video. I’ve embedded the video below. Here are a couple excerpts from the report. While Moab is an obvious hotbed of adventure sports and activities, from biking, hiking, rafting, four-wheeling and general climbing, it’s also one of the most famous crack-climbing spots on the planet. This is proven within only a few minutes of our arrival, when we immediately meet people from all over the States, Spain and Scandinavia, all eager to tackle the walls. You can see the additional draw to this place: there is an abundance of climbs, as well as two national parks (Arches and Canyonlands) and several State Parks, within the area. Utah’s Indian Creek certainly has something special about it, a combination of the red rock, blue sky, pristine white clouds – it feels almost magical. Combine this scenery with a hard day of superior climbing and you’ll truly relish that cold beer at sunset. Backcountry.com Indian Creek shoot on Vimeo. 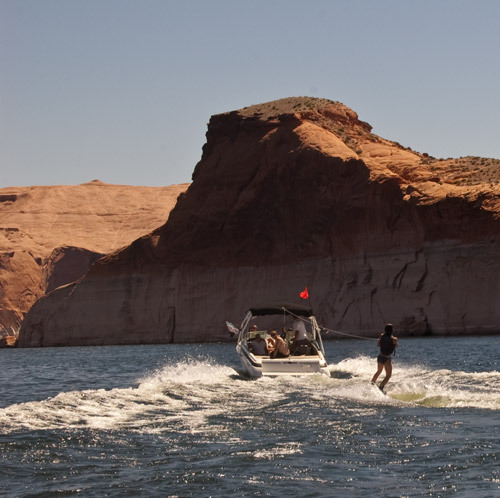 The latest Utah.com newsletter is out and it focuses on Lake Powell. You can see it here. In the newsletter I tell a little about my recent trip to the lake, and describe what conditions will be like there in the fall. My recent trip was almost perfect. I include two of my photos here, to give you a glimpse of the fun. We camped on the beach, in our own private cove with a sandy beach and warm water where the kids swam and played. We pulled kids on wakeboards, kneeboards and tubes, enjoyed the scenery and did some fishing. The weather was hot, blazingly hot, and that's the reason the trip was only almost perfect. During the day the air temperature climbed into the high 90s F, and the breeze felt like it was coming from a blast furnace. The water temperature was a very pleasant 80 F, and so we spent as much time as possible in the lake. The water felt delightful. We had a sliver of a moon at night. As it set the stars were left to themselves and they rose to the occasion. The night sky was amazing. In August, Lake Powell is wonderful during the morning, and in the evening as the sun goes down. During the afternoon you hunker down in shade or play in the water. September and early October my favorite times to visit Lake Powell, as I said in our newsletter. The air is warm but not oppressively hot. The water is still warm and enjoyable and the fishing is great. We had great fun on our trip. Now I'm anxious to go back. If I can work out my schedule, I'll be back in late September. The 21st annual Timpanogos Storytelling Festival will be held Sept 2-4 at Mt Timpanogos Park, in Orem near the mouth of Provo Canyon. The festival is billed as the largest storytelling festival in the Western US. See www.utahvalley.com for details. Below are highights. From across the country, storytellers as varied as Mount Timpanogos is tall enter the shadow of the mountain, clad in practiced skill and bearing a hundred tailored tales. Twenty-seven thousand listeners of all ages gather around them because they know when they hear the echoing fables, they cannot help but to become a bit wiser, a bit more human. Enjoy the stories of many Festival favorites including Donald Davis, David Holt, Bil Lepp, Carmen Deedy, Charlotte Blake-Alston, Syd Leiberman, Connie Regan-Blake, Barbara McBride Smith, John McCutcheon, Bill Harley, Heather Forest and Angela Lloyd. On bicycles, a dozen riders set out on a 400 mile course to see the best of the Four Corners area in five days, Hovenweep National Monument, Monument Valley and Natural Bridges National Monument before ending at Lake Powell. The New York Times has this article about the adventure. Below are excerpts. Following little-trafficked byways, our route would at times parallel the San Miguel and Dolores Rivers; swing past the ruins of Hovenweep National Monument and the rock bridges of Natural Bridges National Monument; dip into Arizona and Monument Valley; and do a flyby of the staggering goosenecks of the San Juan River, before finally turning north and plashing to the finish line in the wave-licked shoreline at the north end of Lake Powell at Glen Canyon National Recreation Area. With more than 400 miles of spinning and about 20,000 feet of climbing in five days, it promised to be an undeniably stout ride, especially for a novice cyclist like me. Fortunately, riders had the option of trimming each day by hopping into the “sag wagon” that provided aid and lunch. We traversed 60 to 80 miles a day while describing a J-shaped route — first deep into southwest Colorado, then west into Utah, briefly into Arizona and then north again. On a trip like this, seeing so much, the days lose their shape. Chronology breaks down, replaced by impressions that change with the swiftness of the click of a gear shifter. The way northward toward the finish line went up and over sprawling Cedar Mesa — but how? The mesa ahead was a fortress, rearing up before us in a thousand-foot palisade of sandstone and shale; the world’s most intimidating layer cake. This must be a mistake, I thought; there was no road. Only when we pedaled to the foot of the mesa did a small gash in the cliff appear, a pinched gravel byway that scissored up the rock face: the Mokee Dugway. Originally built in 1958 by a mining company to transport its uranium ore to a processing mill in Mexican Hat, the trail climbed a lung-searing 1,100 vertical feet in less than three miles of unpaved road. At the north end of Lake Powell we tossed bikes aside and dived into the cool waves of the lake while still wearing bike shorts. Toasts were raised. I toasted, too. As I was drying off, though, a different wave hit — a wave of melancholy. Part of me suddenly wanted badly to fill my water bottles and climb back in the saddle. After all, there was plenty of daylight left. The Uinta Mountains in NE Utah are popular for hiking and backpacking. The mountains are dotted by small lakes, reservoirs and streams, which are very popular places to fish and camp. Much of the area is wilderness. You can drive to trailheads, but then you have to travel by foot or horseback to go farther into the mountains. The area includes Kings Peak, the highest mountain in Utah. Every summer dozens of people trek to the top of the peak. Others hike or backpack just to relax, fish, camp and take photos. The area includes a network of interconnecting trails, which lead to Kings Peak and the most popular lakes. I really enjoy the Uintas and I've hiked many of its trails. Lately I've enjoyed hiking off the trail – bushwhacking to find lakes that seldom see humans. I'm a serious fisherman and some of these lakes provide excellent action for various kinds of trout. I scour the Internet and guidebooks to find information about remote lakes. When one sounds interesting, I find its location, including latitude and longitude. Google Earth is a great resource to find coordinates, which I program into my GPS. I think let the GPS guide me to the lake. Last weekend I bushwhacked to a small lake called Whiskey Island, located in the Bear River drainage. We drove up a rough 4X4 road to within a mile of the lake, then headed out into the forest to find it. The trees were think and we couldn't see more than a few dozen yards ahead. We had to climb a steep, rocky ridge, climbing over lots of dead fall. Rough going, but only for about 1.2 miles. We hiked right to the lake, exactly as planned. I get a great rush when I find such a remote, beautiful spot. One guidebook said Whiskey Island Lake has large Arctic grayling, a small, funny-looking fish in the trout/salmon family. 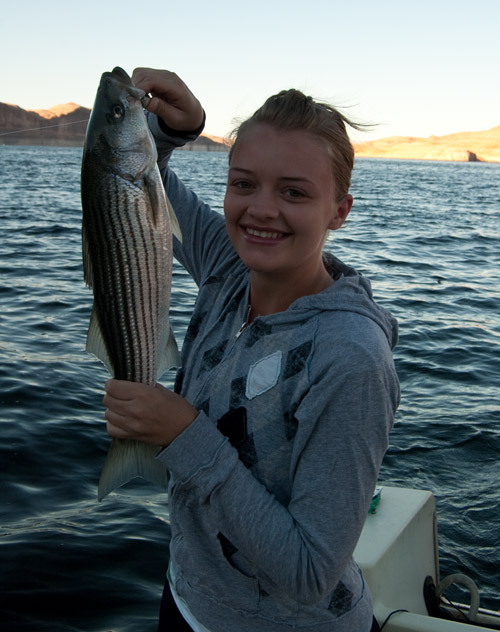 A few lakes in the Uintas have grayling and they are fun to catch. We fished hard but only caught tiny grayling. Many fish bumped our flies but they were so small they had a hard time getting their mouths over our hooks. So fishing was good but catching was slow. It was a very fun trip. On a vacation road trip from Wisconsin, Jeff Holmquist and wife visited 8 national parks in 8 days. Jeff write this article about the trip. Below are excerpts. A check of a new Rand McNally Atlas proved helpful. It appeared we could visit a large number of parks in a short period of time if we headed to Colorado, Arizona and Utah. By keeping an eye on the online reservation system, we were able to book accommodations at all of those locations within two weeks of our travel date. Next stop was Zion National Park in southern Utah, a good five hours away from the south rim. The east entrance into this park is perhaps one of the most dramatic sights you’ll encounter. A variety of rock formations give way to a one-mile long tunnel. When you exit the other side, you’re surrounded by incredible beauty. This was clearly one of the highlights of the trip. Bryce is a compact and impressive sight. Colorful spires reach skyward and the view goes on for miles. Later that evening, a storm in the distance offered up a spectacular rainbow that crowned Bryce’s glorious spires for well over an hour. The camera, however, failed to capture the moment. Don’t miss some of the extra side trips along the way. We stopped at the Glen Canyon Dam and swam in Lake Powell on our way to Zion. It was a nice change of pace. Also, the Four Corners monument (where you can stand in four states at once) was under construction when we drove by. We stopped anyway and found out that a huge flea market of authentic Native American arts and crafts operates daily at that location. The prices were more reasonable than items sold in the gift shops at the national parks. The annual Park City Kimball Arts Festival, one of the top art festivals in the country, will be held August 6–8, 2010. More than 230 artists have been selected to participate in this juried show, featuring work in 12 categories – ranging from paintings to jewelry to sculpture and photography. The three-day festival is set to offer a newly programmed multi-sensory artistic experience for its anticipated 45,000 attendees, including visual-art exhibitions, live musical performances, cuisine-related activities, art-focused film screening, as well as its largest fund raising event, The Park City Kimball Arts Festival Opening Night Gala and Auction. The Park Record newspaper has this article on the festival. Below are excerpts. The Opening Night Gala and Art Auction on Friday evening is sold out, but it's not the only way to kick off the festival and support the Kimball Art Center. The public is invited to a sneak peek at artist exhibitions on Main Street from 6 to 9 p.m. The preview is free with donations being accepted in any amount. Weekend hours for the Arts Festival are Saturday 9 a.m. to 7 p.m. and Sunday 9 a.m. to 6 p.m. Admission is $10 adults for adults and free for kids 12 and under. Tickets purchased on Saturday may be used for re-entry on Sunday. Artists working in ceramics, drawing, fiber, glass, jewelry, metalwork, mixed media, painting, photography, printmaking, sculpture and wood will be showcased in individual booths lining both sides of Main Street. The artists sell their own pieces and often work on-site. A major focus this year is the musical aspect of the festival, which will encompass two outdoor stages and the BMI Music Café at Downstairs, a venue fashioned after the Sundance Film Festival's ASCAP Music Café. "People who are die-hard music fans can come enjoy these singer-songwriters and bands that are really on the cusp of breaking out," Marrouche says. A new addition to this year's festival, Taste of Art, will showcase the menus and cuisine of Park City restaurants. Many local establishments have partnered with the Kimball Art Center to offer arts festival attendees exclusive discounts and deals. Entrance fees will be waived at US national parks on August 14 and 15, as part of a program to encourage people to visit. Utah's 5 national parks are participating in the program, as are most of the state's national monuments and historic sites. America’s Best Idea – the national parks – gets even better this year with several fee-free days at more than 100 national parks that usually charge entrance fees*. The twice-yearly Outdoor Retailers Show runs Aug 3 through Aug 6, at the Salt Palace Convention Center in downtown Salt Lake City. The sold out event is expected to attract some 21,000 people, so there will be heavy traffic and few parking spots in the immediate area. One exception is the free Slacker Clinics being held by Gibbon near the south entrance to the Salt Palace at 9 am, noon and 3 pm. Gibbon pro liners will be there to help participants learn to better master the balance game. Also, there will be some goodies given away at the clinics. On Tuesday morning, US Interior Secretary Ken Salazar and Nancy Sutley, chairwoman of the White House Council on Environmental Quality, will address those attending the show. They will then participate in two “listening sessions” to hear Utahns' ideas about conservation, recreation and management of public lands. Both listening session will be on Tuesday. One will be at 10 am for the general public and another at 2 pm for youths. Both will be in the Wasatch Room of the Radisson Hotel Downtown, 215 W. South Temple.